The First Response Is To Be An Insulator. When struggling with a disappointment or a setback, the common response of an Insulator is to wrap himself or herself up in such a disguise that no one can access his or her heart and hurt them again. Just like Saul and Adam and Eve, they believe the lie that it is easier to hide than it is to face their responsibilities. The Insulators hide within layers of emotional armor in an attempt to prevent anyone from ever seeing who they really are. They go to great lengths to wrap themselves in insulation. They refuse to risk emotional intimacy because of the pain of past hurts. The Second Response Is To Be An Isolator. This group of hurt people break my heart the most because the Bible says in Genesis 2:18, “And the LORD God said, It is not good that the man should be alone; I will make him an help meet for him.” Relationship and fellowship is not a luxury; it is a necessity. The common response of an Isolator when they are struggling with emotional darkness and difficulty is to Isolate themselves to avoid the possibility of rejection! Unlike the Insulators who engage in relationship, but beneath layers of protective padding, the Isolator may stand before you, but it is clear that they are not with you. The Isolators have left their battered heart at home, removed from their daily routine, protected from interaction. Like a patient in the intensive care unit, the Isolator’s emotional health may be so fragile that they do not want to risk taking their pain off of life support. Isolators feel safest in a perpetual state of suspended dislocation. They have the misconception that Isolation and solitariness is freedom, when it is actually their prison cell! Their Isolation protects them from What They Fear but it also Isolates them from What They Need. This dangerous response to life’s difficulties is really people phobia. The Third Response Is To Be An Inhibitors. They asked her Who she was, but she answered How she was. She let what she went through change and redefine her identity. An Inhibitor’s common response to the disappointments of life or the wounding of others is a sense of pessimistic frustration that is unparalleled. Enough is never enough to make up for what they have lost, what they have endured, and what they continue to carry around inside of their wounded soul. They live trapped in a perpetual state of frustration, regardless of what they attain or accomplish. Like pouring water into a rusty bucket, there is no compliment or encouragement that stays with them because they leak out through the holes of Human Hurts and Difficult Disappointments that have never been healed in their soul! They tend to try and find solace by Making Money, Achieving Another Promotion, Reinventing Their Appearance, Hiding In Hobbies or Avoiding Relationships. 1. Please understand that your absence increases the load and burdens of all those left behind by your emotional withdrawal. 2. Please realize that your method of escaping from life’s responsibilities and relationships breaks ties that may never be repairable. 3. Please recognize that escapism, while appearing to offer relief for your emotional hurts, is in reality robbing your soul of God’s sufficient grace. Only God’s grace can heal your hurts. 4. Please return to your friends of a lifetime and the fellowship of God’s people – you're needed and loved. On Sunday evening, October 25th, I preached on one of the greatest life principles ever discovered that was spoken by the Apostle Paul and inspired by the Holy Ghost in the New Testament book of Philippians. In two familiar verses the Apostle reveals this life principle. The Apostle Paul is not just talking about the bad things in his past being forgotten, but the good things as well. In Philippians 3:7, the Apostle writes, “But what things were gain to me, those I counted loss for Christ.” The word Loss in this verse means detriment. In verses 5-6 the Apostle lists seven religious credentials that were now viewed as liabilities. Christian and every local Church. 3. All you can do with your Good History and Bad History is Learn From It and Leave It! of Their Past will never embrace Their Potential! the future! You are not limited by Your History; you are only limited by Your Destiny! consciously forget those things in the past, even the ones you once counted as gain! available to help me reach My Destiny. use your Energy to look back or to reach forth. You cannot do both! have not been made right – make the necessary restitutions, apologies, or amends. You and I had better develop the ability to forgive and move on, or we will stay Crippled, Conflicted and Critical all of our lives. Survival necessitates that we develop the ability to forgive and move on. I don’t just move on because I am nice – I move on because it costs me too much energy to stay angry, and I need my energy to get to where I am trying to go. If I give My History too much Energy, I won’t have the Energy I need to get to My Destiny! How many times have we missed Our Destiny because we kept putting too much Energy into Our History? Put the past to bed and get up and go on today with your Life. I don’t have, and neither do you have the resources to feed both Our Past and Our Potential, Our History and Our Destiny! Our Life is too short and our Energy is too limited. Since my earliest memories, as a child growing up in a pastor’s home, church growth and its importance have been second nature in my mind. It became, without my even realizing it, part of my PK subconscious. Church growth in the 60’s, 70’s and 80’s was all the rage. Especially among Baptists, building big Sunday Schools was the mandate of our movement. In the church world, during my growing up years, church growth was the standard of success. If a church was growing, it was the clear evidence that God’s hand was on its pastor, and it was clearly the model to be followed by other churches. All of this was prior to today’s megachurch and emerging church movement. Before I get too deeply into my thought, let me declare that keeping sinners out of Hell and raising up vibrant, growing churches for the glory of God is still our central mission. Let me declare, as I am fast approaching my thirtieth anniversary as the founding pastor of the Grace Baptist Church in Gaylord, Michigan, that I am still excited about seeing souls saved and the church grow. I still have a vision to reach everyone I can as long as I can with the message of the Gospel of Jesus Christ. I am still passionate about seeing every area of our local church ministry prosper and expand as we seek to impact our community and region for the glory of God. After three decades of ministry in a small town, God has been incredibly good to us. In these past 30 years we have seen thousands of people saved and have averaged between 700 and 800 in attendance for many years. We have been over 1,000 in attendance many times with a record attendance of 1,573 on one Sunday morning. We have started or had a part in starting 5 other churches and have given over $2,000,000 to Faith Promise Missions. Our passion for church growth and winning souls is unquestioned, but pastoring in a town of 3,500 people and a county with a population of 22,000 has impacted my thinking about church growth in a way that I think qualifies me to make some candid observations that may be a little out of the box. I understand that challenging your thinking in this arena may make me the object of your criticism, but I won’t shy away from the truth just to be politically correct. Let me propose some fresh thinking on the subject of measuring church growth. Although many of the church-growth and church-health principles taught at most pastors’ conferences and expressed in most Bible colleges sound good, they do not always measure up. I am not trying to be cutting edge; rather, I want to be Biblical in every aspect of our church. We are not looking to churches like Saddleback for inspiration, but rather to the churches in the book of Acts. The new catch words for church growth are “Community”, “Small Groups”, “Relevance”, and things like “Community Missions Projects” which are usually feel good events like painting a house, picking up trash for the city, or aiding the community in hosting a festival. These kinds of social gospel methods may be good public relation stunts, but I am not convinced they are the Biblical method of church building. The bold preaching and proclamation of the Word of God and the spread of the Gospel of Jesus Christ is the main mission of the New Testament church today as it has been for 2000 years. It is refreshing to attend a church and see almost all participants with their Bibles open during the sermon. It is also impressive to hear lively, spirited, and yet conservative music. I am talking about a church with a choir, not a praise team. The song leader may not be a professional, but the people sing with joy. It is even more impressive when the congregation begins to pray, and there is a strong and focused emphasis on prayer. To hear a church pray for real and take legitimate needs to God during the service, sadly is not that commonplace. Unfortunately, what I have just described would never pass the church-growth test because it wasn’t an advertisement for the church or a display of their professional production capabilities. In many big churches today, the service is so dependent on mood lighting, electric instrumentation, sound amplification, and video enhancement that if the power were to go off, they would not be able to have church. Let’s stop trying to have a show, and instead, let’s get back to the Scriptures. We don’t need to use lighting special effects or any other technology to create an atmosphere if the power of God is at work in the service. Many production-based worship services lean heavily toward manipulation rather than inspiration. I am for persuasion, but not manipulation. The preacher needs to stand before the congregation, filled with the Spirit, with a persuasive argument from the Scripture. Here Is My Most Provocative Question - Do your church members know their Bible? Can they give a defense of the attacks against it? Can they rightly divide the Word of Truth? Do they have a Biblical Worldview that understands creation (A Young-Earth), Morality (Why Gay Marriage Is Wrong), Eschatology (Pre-Tribulation Rapture), Salvation (Jesus As Our Only Hope), Grace (As Opposed To The Cheap Grace Revolution Misleading Thousands), and so much more? Have you and I developed a church full of believers who know their Bibles and who live it out before their families, co-workers, and community? Here Is A Final Provocative Question - Does your church have an executive or a shepherd as its pastor? Pastor, quit acting like a corporate CEO and get back to your Biblical mandate of shepherding your precious people. The leadership model of the Bible is Servant-Leadership or what I like to call Shepherding-Leadership. In many of our fundamental Bible colleges, the leadership model being espoused is Kingdom Building not Shepherding the Sheep. When we call the pastor the “Lead Pastor”, I fear we are trying to sound corporate rather than Biblical. The local church is not the Pastor’s Kingdom, and he is not a CEO over a ministry empire. In such a leadership model we tend to set up superstar pastors who have a celebrity image, and their church becomes the basis of their influence. If the church is big, the pastor is viewed as an expert and is in demand. I praise God for the godly pastors of large ministries that have influenced me. My observations are not intended to sound critical or judgmental, just honest. We need a new generation of humble, anointed shepherds who have devoted their lives to prayer and the ministry of the Word, ministering to the flock under their care. I happen to believe that if people attend a church where they cannot call the Pastor and talk to him, they don’t really have a pastor. Preacher, your people need to know their pastor - not just know who he is, but know him. This puts a lot of added pressure on me as the pastor of a fairly large church, but just because something is difficult to do does not mean it is wrong. Remember when Peter assured the Lord, “Though all men shall be offended because of thee, yet will I never be offended.” Of course we know that Jesus informed Peter that he would not only fail to stand with Jesus in his most difficult hour, but that his would be the most spectacular of failures. In my humble opinion Peter was acting like a King when he made that prideful promise to Jesus. Listen to Peter’s last words of counsel to future preachers and pastors in I Peter 5:1–4. “ The elders which are among you I exhort, who am also an elder, and a witness of the sufferings of Christ, and also a partaker of the glory that shall be revealed: Feed the flock of God which is among you, taking the oversight thereof, not by constraint, but willingly; not for filthy lucre, but of a ready mind; Neither as being lords over God’s heritage, but being ensamples to the flock. And when the chief Shepherd shall appear, ye shall receive a crown of glory that fadeth not away.” Peter, under the inspiration of the Holy Ghost, is revealing to us that the New Testament model of leadership is Shepherding not Kingship. Pastor, while it may be true that larger crowds and greater results in salvations and baptisms may be an indicator of church growth, these alone are not an adequate measure of church growth. True, measurable church growth is far more than numerical and financial; it must also be Biblical and Philosophical. A healthy church is not just winnings souls; it is also Biblically Led and Biblically Literate. A healthy church is not just Financially Strong; it is also a Fasting and Praying congregation. Any discerning, sincere Christian wants to know why people leave churches, why spouses leave each other, and why people will make a major course change right in the middle of their lives. Our first reaction is to wonder what was wrong, or who disappointed them. Did they have an eye opening experience? Was there something wrong with their spouse, their church or their situation? I want you to remember one very simple and yet profound word – the word Momentum. The reason many people walk out of their commitments, walk out of a church, or walk out on their life situation is they have lost momentum. Momentum is a commonly used term in Sports, in Business, in Relationships and in Ministry. A team that has momentum is a team that is on the move and is going to take some effort to stop. Momentum is a physics term; it refers to the quantity of motion that an object has. Momentum can be defined as "Mass In Motion." When you have momentum in a church, in a marriage, in a career, in a business, or in a family, everything seems to go right. When it comes to achievement, momentum is a leader's best friend. But once momentum is lost, it is nearly impossible to get back. It is more easy to maintain momentum than it is to try and restart it once it is lost. 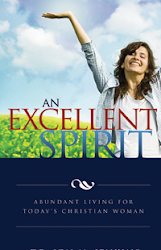 A study of the life of King Solomon is a classic example of How Momentum Is Built. When God offered Solomon anything he wanted, he humbly asked for leadership wisdom above all else (I Kings 3:9). He made many wise decisions that won him credibility (I Kings 3:28). He maintained the peace (I Kings 4:24). As a leader, he surrounded himself with many wise associates (for example: Azariah, Zadok, Abiathar, Zabud, Jehoshaphat, Benaiah, Adoniram, Ahishar, Zabud). However, it is more easy to Build Momentum than it is to Sustain Momentum. I’ve learned that momentum does not sustain itself. It all begins with our being willing to accept responsibility for our marriages, our ministries and our own personal spiritual momentum. I have to direct the momentum in my life rather than let it direct me. I cannot become calloused, careless and carnal, or I risk losing my momentum. From time to time we all must fight the temptation to become lazy and fall into a comfort zone. Whenever we begin to coast, it is only a matter of time before we begin to see our momentum start to slip. Often times frustration, failures and the general fatigue of life can cause us to take a sabbatical that is a little too long. Before we know it, our church life, our married life or our family life has become stale and stagnate. Suddenly, we let the hurts, hindrances and hardships of life stop us dead in our tracks. Our momentum is gone, and we start thinking that if we change churches, change addresses, change careers or change spouses we can get our joy and excitement back. But we are never further from the truth than when we get to this place. The right kind of momentum is never gained by doing the wrong thing. To rediscover and recreate the momentum that I have lost, I must first admit that I have lost my momentum. I don’t need to quit my job, quit my church, quit my ministry, or quit on my family. The next step I need to take is to identify the Motivating and Demotivating factors in my ministry, my marriage and my own mind and do a Checkup, not a Checkout. I may need to reevaluate my schedule, my priorities and yes, even my commitments. I do not reevaluate so that I can back up, but rather to refocus on what’s really important. We must also not forget that there is a “Great Falling Away” predicted for the Last Days. Scripture gives every indication that many professing Christians will move in increasing velocity away from the things of God and toward the things of the world. In the days ahead, it will be increasingly difficult to swim against this powerful current. It is hard to maintain spiritual momentum when forces from many directions are trying to pull you away from Christ, away from Church and away from your Convictions. 1. Prayer is either nonexistent or at best mechanical. 2. You know the Word of God but you don’t really live it. 3. Earnest thoughts about eternal matters no longer stir and grip your heart. 4. You can indulge in inward and outward sin without feeling devastated. 6. You're more focused on your liberty in Christ than you are on your responsibility to Christ. 7. The pursuit of money and possessions is the primary focus of your life. 8. Your main concerns are your temporal, earthly life. 9. You no longer hunger for a deeper life in God. 10. You don’t live with a full and grateful heart. 11. You have little concern for the needs of others, and make little effort to meet them. 12. Your giving is a chore and you justify not tithing. 13. Sports, entertainment and pleasure are important aspects of your life. 14. You are more concerned with your image than with the reality of your life with God. 15. You are full of bitterness, hurt feelings, criticism, and you are not going to take it any more. 16. You have a head full of Biblical knowledge, but your heart has become cold, calloused and hard. 1. Admit and discover why you lost momentum. 2. Get your stalled ministry, marriage, relationship or situation started again. 3. Change direction and get back on course. Without forward progress, it’s difficult to change. Without forward progress, it is nearly impossible to change. Seem too small and little known? “Little is much when God is in it! 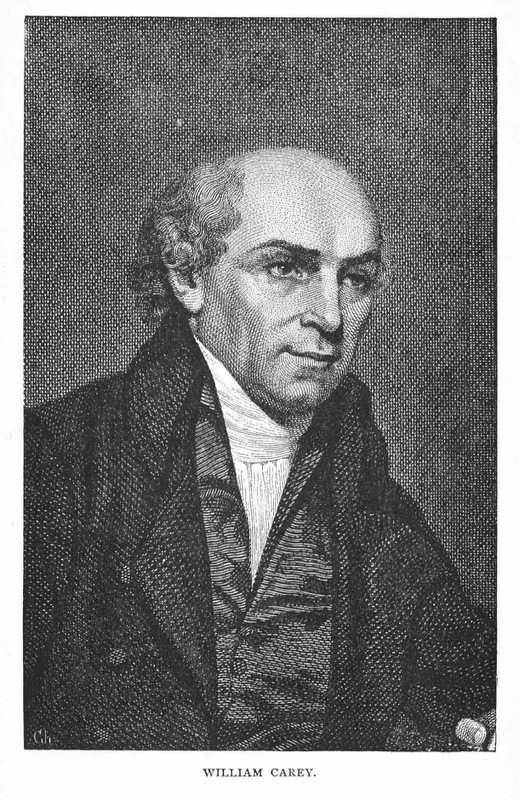 The great Baptist missionary William Carey was born in England in 1761. Carey spent an active forty-one years serving the Lord in India; his work there included translating the Scriptures. William Carey was one of God's giants in the history of evangelism! This great servant of God would earn the nickname “The Father of Modern Missions.” It was Carey who preached the epoch message, "Expect Great Things From God. Attempt Great Things For God." When he died at seventy-three in 1834, he had seen the Scriptures translated and printed into forty languages and had seen India open its doors to world missions. I love the story of William Carey’s conversion. One day an old minister in England walked into his churchyard, sat on a tombstone and began to weep. His officers had just notified him that they felt he was getting too old to pastor the church, and that he should resign and let a younger man take his place. As he sat there brokenhearted and discouraged, he saw a boy coming down the street. He was fond of children and called to the boy and asked him to come and sit down beside him. The young fellow sat down beside him on the tombstone. The old preacher, forgetting about his own sorrow, told the young fellow about Christ and the wonderful story of the gospel, and then led the little fellow to Christ. The old preacher went back to his manse and to his sorrow, and it was not long after that he was called to his eternal reward. 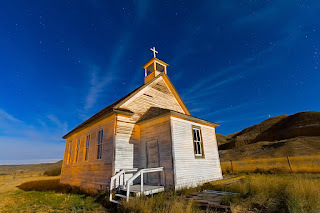 No doubt the old preacher looked down from the other side and watched that little boy grow to become a teacher, shoe cobbler, and lay preacher. No doubt he watched as the boy, now a man, fashioned a leather globe and then broke down and wept while pointing out distant lands to his students. No doubt the old preacher watched from the balconies of heaven as the little boy that he had led to Jesus while sitting on a tombstone left one day as a missionary to India. That little boy he led to Jesus was William Carey. Teen Spec - The Granddaddy Of Winter Youth Conferences Turns 27! On February 18th, 1989, over 400 teenagers and youth workers assembled in the brand new auditorium of the Grace Baptist Church in Gaylord, Michigan for the very first Winter Teenage Spectacular youth conference. The Grace Baptist Church partnered with the Bible Baptist Church in Charlevoix, Michigan to host a mid-winter, Saturday youth conference. The standing room only crowd that packed into the six month old auditorium of Grace Baptist Church was excited. The churches that attended that first year were mainly from Northern Michigan. No one could have known that on that snowy third Saturday of February in 1989, the Granddaddy of winter youth conferences had been born. Within a decade, the crowds had outgrown the auditorium of the Grace Baptist Church. The conference was first moved to the Gaylord intermediate school gymnasium. The very first year in the intermediate school gymnasium saw the crowd swell to over 750 teens in attendance. Over the next five years, the crowd grew to over 1,000 and then to over 1,200 and then, with over 1,500 in attendance, the entire gymnasium, the bleachers on both sides and the main floor were packed to capacity. By this time, Teen Spec had become a two day conference with downhill skiing introduced to the schedule on Friday evenings. The exciting decision to add a third day to the conference took the entire program to another level. The conference now started on Thursday afternoon and lasted until Saturday afternoon. With the introduction of a third day, a volleyball and basketball tournament was added to the schedule in addition to downhill skiing. The conference was moved to the Boyne City High School gymnasium, the largest venue available in the area. For several years, this brand new gymnasium was filled to capacity with the crowd growing to over 1,700 in attendance. Six years ago the venue was changed one more time to the Treetops Ski Resort Conference Center just east of downtown Gaylord. Capacity crowds continue to fill the building each year as Teen Spectacular has become the benchmark by which most other winter youth conferences are measured. In the last 26 years, teenagers from 35 states have attended this great conference. This year, on March 5th-7th, 2015, the Grace Baptist Church of Gaylord will host the 27th annual Winter Teen Spectacular once again at the Treetops Convention Center. When Teen Spec began 27 years ago, there were almost no other winter youth conferences being held. This year, In the months of February and March, I know of at least 11 other winter youth conferences being held across the country. Many of these conferences were inspired by the Granddaddy of winter youth conferences – Teen Spectacular. Teen Spec is really so much more than a youth conference or a youth rally. It is more than a pizza, preaching and skits it is an event. It has actually become more of a winter teen camp, covering three days and multiple events, activities, but with great music and great preaching still the central focus. Since its very beginning, Teen Spec has featured some of the best youth preachers in America. Once again, the 2015 conference will feature a tremendous line up of great preaching from Bro. Derek Hagland, Bro. Jeremiah Young, Bro. Kurt Skelly, Bro. Randy Dignan, Bro. Abdel Judah, and Bro. Tony Shirley. You will not find a better line up of nationally known youth speakers anywhere in the country than those found at Teen Spec 2015. We are thankful for the many other youth conferences that God has raised up over the past 27 years across the country and for the inspiration that Teen Spec has been to these good meetings. We rejoice in the team spirit that exists between Teen Spec and these other conferences. I have already preached at two of these conferences in 2015 and will preach at another on March 28th. The Granddaddy turns 27 on March 5th-7th, 2015. Over the past 26 years, hundreds of preachers, missionaries, and thousands of other committed Christians across the nation and around the world have had their heart set on fire as a teenager at Teen Spec. Join us this year for another MIGHTY MOVEMENT of GOD at Teen Spec 2015!